Joining the F35 and SRW-9000PL in Sony's lineup of CineAlta 24p digital cinema cameras, the PMW-F3L Super 35mm Full-HD Compact Camcorder continues the democratization of high-end image capture. The camera's newly developed 35mm-size CMOS sensor offers a variety of advantages over smaller sensors, including increased control over depth of field, higher sensitivity in low light, lower image noise, and an exceptional dynamic range. Unlike smaller, broadcast-style sensors or the larger "full-frame" sensor found in some DSLRs, the PMW-F3's chip is on a par with Hollywood film cameras, in terms of field of view and depth of field. That means complete compatibility with cine-style film lenses and consistency of vision for cinematographers used to shooting on 35mm film. Another advantage of the camera's highly efficient sensor is its low power consumption--only 24 watts. Not only does this mean a standard 12V battery can last nearly 3 hours, but the low amount of heat the sensor generates offsets the need for an internal fan--contributing to the camera's extremely light weight (just over 5 lbs). As a result, this is the first CineAlta camcorder designed with a handheld form factor. Using a solid-state workflow based on the XDCAM EX platform, the PMW-F3 records natively to professional SxS media, using the MPEG-2 long GOP codec in an 8-bit 4:2:0 color space. More demanding applications can utilize the camera's dual-link HD-SDI ports to output to an external recorder in 10-bit 4:2:2 or 10-bit RGB (with upgrade). Meanwhile the combination of four HyperGamma settings with S-Log and LUT capability provide RAW-like flexibility to the image data, allowing for increased picture control and dynamic range. An included PL mount adapter strengthens the link between digital cinema and traditional film, providing an efficient means for using any number of professional PL-mount cine lenses--including full compatibility with Cooke /i and Arri LDS technology. Beneath the removable PL adapter, the camera's native, stainless steel F3 mount provides a foundation for future versatility. Its short flange distance will allow for the development of smaller, lighter zoom lenses as well as compatibility with a wide array of both cine and photo lenses (using optional adapters). Other features--such as variable frame rates, multiple-format recording, slow shutter, and uncompressed PCM audio--make the PMW-F3 an impressive companion to its larger S-35 brethren. 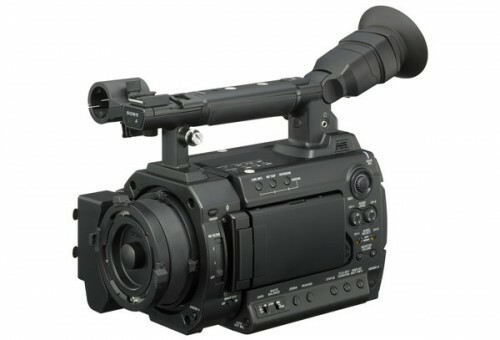 Not only will it intercut perfectly with the F35 and SRW-9000PL as a 2nd unit or B camera, it can easily stand on its own in applications as diverse as indie film, television, commercials, music promos, and education. In the world of digital cinema, these are indeed interesting times--and the PMW-F3 represents another revolutionary stride toward affordable, motion-picture quality imaging. The PMW-F3 is equipped with a Super 35mm sensor, which is the same size as Super 35mm film and has been specifically developed for digital cinematography. Its positioning within the chassis is exactly the same as it would be within a 35mm film camera--ensuring exactly the same optical performance with the unrivalled range of 35mm cine lenses. In addition, Sony's advanced accumulated sensor technologies provide an excellent sensitivity of F11 (ISO 800) and a remarkable signal-to-noise ratio of just 63dB (measured at 1080/59.94i and typical value). A unique Exmor sensor offers exceptional noise reduction and greatly reduces power consumption.